Police have ordered locals to avoid walking in flood water in Townsville, Queensland after a huge crocodile was pictured in the drive-way of a house. 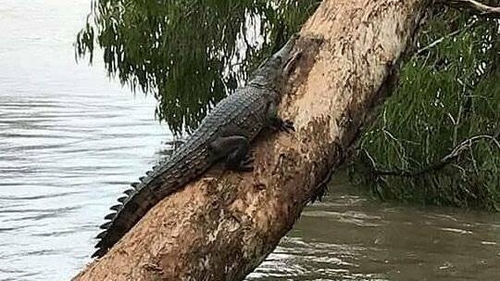 Townsville Police have confirmed multiple sightings of crocodiles in flood waters across the town that has been hit by "flood of the century." Thousands of homes are currently under water after authorities were forced to fully open the city’s floodgates last night due to unprecedented levels of rain that fell. Australia's military has been deployed to tackle the devastating "once-in-a-century" floods that have inundated homes, schools and airports in the country's northeast. The Australian Defence Forces delivered 70,000 sandbags, deployed amphibious cargo vehicles and helped take residents from their rooftops as monsoon rains drenched the northern state of Queensland. The authorities were forced to open floodgates of a major dam late yesterday, unleashing what they called "dangerous and high velocity flows." "We've never seen so much water in our lives," said local radio journalist Gabi Elgood. "You think there can't possibly be any more to come but the rain just doesn't stop." Desperate residents had to contend not only with flash flooding, landslides and power blackouts, but also several freshwater crocodile sightings in residential roads and cul-de-sacs. Kellie Stephenson, who runs local website Support Local Townsville, described flood-hit Townsville as "a disaster zone." She said: "It’s surreal, it looks like something out of movie. It’s very dark and very gloomy and there’s army trucks everywhere trying to keep people off the streets. And the rain just keeps coming." In the last hour, the Bureau of Meteorology (BOM) issued a weather warning of further monsoon-like rains that are to hit Townsville tonight. Claire Mills, Hydrologist with the BOM said: "We are seeing major flood levels at Townsville. Those flood levels have stabilized at the moment but with further heavy rainfall we might see them rise again. Dave Cullen of the North Queensland Irish Association said at least two members of the association had to leave their homes due to the rising flood waters. He said: "The problem it’s just kept on raining, it hasn’t stopped. The mayor says we need to be vigilant until midnight tonight, when the tide comes in. "They had to open the floodgates at the dam and they are wide open right now so water is just gushing out." Mr Cullen, from Wicklow, said the crocodiles pictured are freshwater ones which don’t usually eat humans. He is more worried about snakes that might now be lurking in the floodwater. "Freshwaters don’t eat you - the salt-water ones - they are the ones that eat people. "But they are warning people about snakes. I went for a big run today and you need to be careful of big pools of water because snakes get washed out and that’s a danger for people."